Digital advertising is evolving rapidly in an effort to keep up with changing consumer media consumption habits and device usage. As more women migrate to mobile devices, more of their time and attention is devoted to content streams, making it harder for traditional digital ad campaigns to reach influential women. As part of our 2015 Evocative Web study, POPSUGAR Insights explored the relationship that women have with native advertising and the role that high-quality visual content plays in creating emotional connections with women. In general, we found that 69% of women prefer advertising that is native, or advertising that is blended into the overall site or platform experience. Women between the ages of 35 and 40 are even more likely to prefer native advertising experiences (73%), while women 18 to 24 are as likely to prefer native (69%). Over 78% of women prefer ads that use original photography, and exposure to high-quality branded visual content has the opportunity to stimulate positive emotions in women. 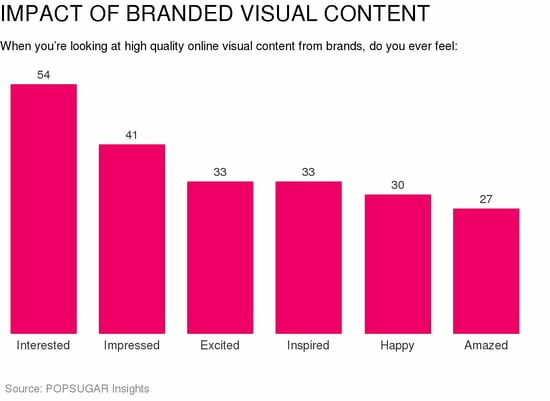 The women who we surveyed said that branded visual content makes them feel interested (54%), impressed (41%), excited (33%), and happy (30%). In fact, women view brands that use high-quality images as being creative (53%), experienced (48%), knowledgeable (46%), entertaining (39%), and trustworthy (33%). The bottom line is that brands have an opportunity to create a long-lasting, positive emotional connection via branded visual content, but high-quality experiences need to be the rule, not the exception.